The finished rear of the home reflects its modern transformation, with spare stucco walls and an expansive deck. 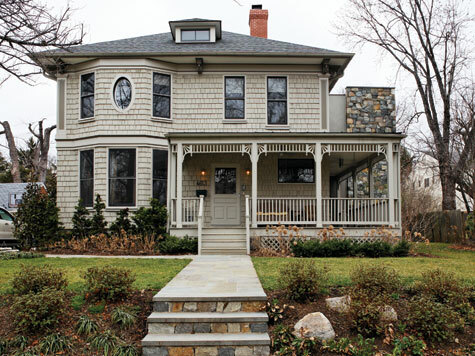 The crisply detailed Victorian, with its wraparound porch, bay windows and cedar-shake exterior, looks as true to its century-old roots as the other homes lining its peaceful Chevy Chase street. But beyond the prim façade, tradition gives way to the 21st century and a thoroughly modern interior unfolds. Initially, the owners had no intention of embarking on a large-scale project; they simply wanted to finish their basement so that their three sons would have an indoor play space. The existing basement, according to builder Laurence Cafritz, was a wet, leaky mess with low, six-foot ceilings. “It was pretty grungy down there,” he says. Creating usable space in the basement would involve major excavation. As the owners weighed their options, they decided to expand the scope of the work and renovate the entire house, which had other pitfalls including an antiquated kitchen and an awkward 1980s rear addition. The owners approached architect Andreas Charalambous to execute their vision, preserving the façade and front rooms of the original house, then transitioning to a modern, open program. Charalambous drew up the conceptual plan and then architects Steven Spurlock and J. Garrett Pressick of Wnuk Spurlock took over, completing the working drawings and finish details. 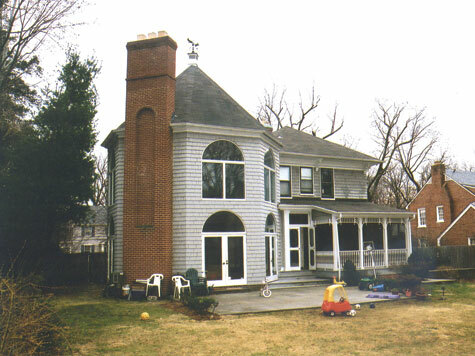 About 1,000 square feet of the original house remain intact, with 7,000 square feet of the new or remodeled space making up the rest in the first and second floors and new, fully finished basement. The gallery entry introduces a modern sensibility but features a restored mantel from the original home (on right). Steel cable rail separates the dining room and renovated great room. Today, visitors enter what Spurlock and Pressick call a “portal” where the now-restored stair rail, moldings and double-sided fireplace mantels convey the home’s architectural heritage. The traditional detail gives way to modern in the gallery, with its recessed flush baseboards and halogen lighting. On the right, the gallery leads to the dining and family rooms, where the octagonal 1980s addition once stood. 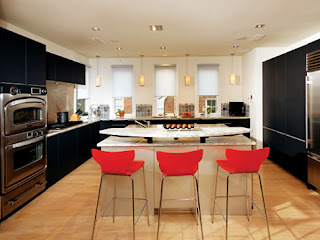 A breakfast area is centered in the new space where architects designed a second staircase leading to the bedrooms. To the left, the gallery opens onto a completely refurbished kitchen with Poggenpohl cabinetry, a custom raised breakfast bar and TurboChef ovens. A former screened porch has been converted into a keeping room with a built-in desk for homework. Abutting the kitchen, a new entrance leads to a mudroom where lockers for each family member keep clutter at bay. It contains a family powder room, while a more formal powder room is located off the gallery. Both gallery and kitchen offer access to a terrace in the backyard, where the clean-lined rear façade reflects the home’s new modern aesthetic. Second-floor updates include an airy landing with skylights, a master suite with a spa-like bath complete with a steam shower, and new bedrooms and bathrooms for the boys. The sons now enjoy a full basement with a home gym and a large play area where “abuse-resistant” walls can withstand incoming hockey pucks. There is also a drum room for budding musicians, a full kitchen, a guest room and a full bath with a large, tiered steam room.